Anemia continues to be a major public health problem in many countries. The prevalence and intensity of urinary schistosomiasis, which contributes to anemia, often peak at school age adding to that age group’s nutrition and disease burdens. However, unlike malaria and hookworm infections, little is known on the role of urinary schistosomiasis in iron deficiency anemia. The objective of this study was to assess the prevalence of iron deficiency anemia and the effect of iron supplementation on hemoglobin (Hb) and serum ferritin (SF) levels among school children infected with Schistosoma haematobium in Bamako, the capital city of Mali. A total of 150 anemic school children between 7 and 12 years were randomly assigned to receive either 40mg/kg of praziquantel or 40mg/kg of praziquantel (P) + daily 66 mg of iron (Fe), five days a week for three months. Hb and SF were measured at baseline and at 6 and 12 weeks of the intervention. Only children who had complete Hb and SF data at each stage of the trial were included in the statistical analyses (n = 74 in the P+Fe group; n = 66 in the P group). At baseline, mean Hb (g/dl) was 10.53±0.93 in the P group and 10.47±1.17 in the Fe+P group; mean SF (µg/l) was 34.39±37.58 in the P group and 29.82±23.34 in the Fe+P group, and the prevalence of iron deficiency was 17.2%. At 6 and 12 weeks of the intervention, there was an important reduction in anemia and in iron deficiency in both treatment groups. Mean Hb (g/dl) was higher in the Fe+P group (11.63±0.88 and 11.55±0.94) than in the P group (11.14±0.98 and 10.84±0.86) at 6 and 12 weeks, respectively. Mean SF (µg/l) was also higher in the P+Fe group (74.26±40 and 100.29±53.92) than in the P group (40.65±35.63 and 40.70±29.57) at 6 and 12 weeks, respectively. In these Schistosoma haematobium infected children, iron deficiency was prevalent and treatments with P alone or in combination with Fe supplementation were able to increase hemoglobin and iron stores. Neither P nor P+Fe by alone completely reversed anemia in this sample population. 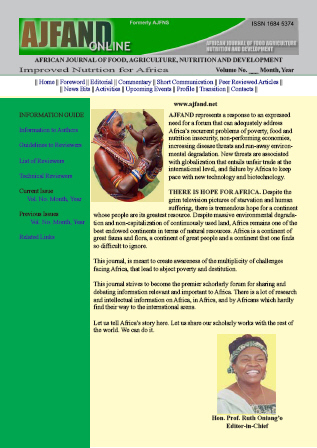 © Copyright 2010 African Journal of Food Agriculture, Nutrition and Development.